INTRODUCTION: Magnetic Anchoring and Guidance System (MAGS) instruments consist of an internal surgical device coupled across the abdominal wall and manipulated using an external handheld magnet. 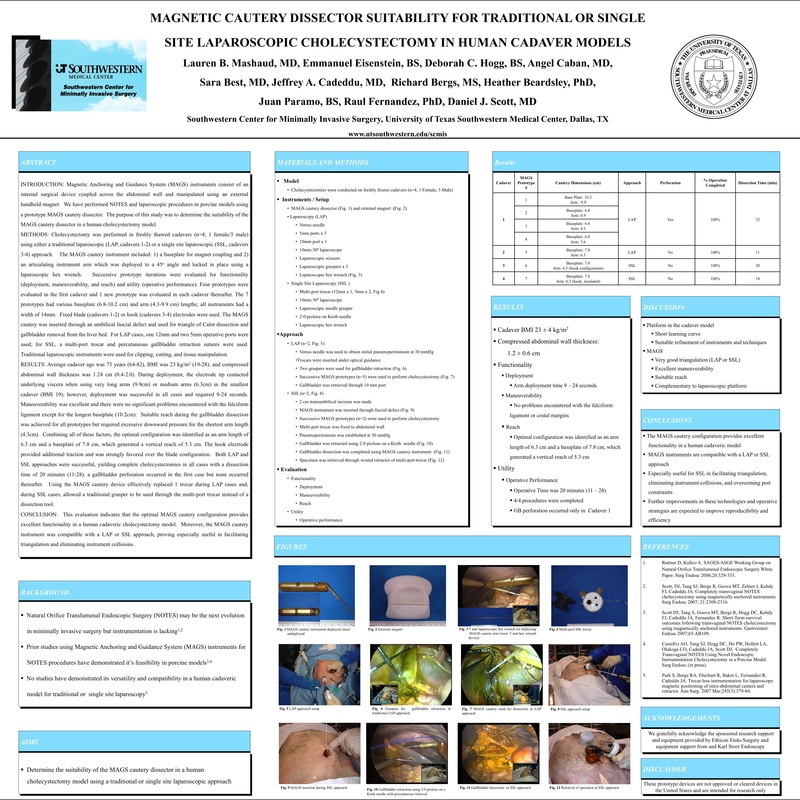 We have performed NOTES and laparoscopic procedures in porcine models using a prototype MAGS cautery dissector. The purpose of this study was to determine the suitability of the MAGS cautery dissector in a human cholecystectomy model. METHODS: Cholecystectomy was performed in freshly thawed cadavers (n=4, 1 female/3 male) using either a traditional laparoscopic (LAP, cadavers 1-2) or a single site laparoscopic (SSL, cadavers 3-4) approach. The MAGS cautery instrument included: 1) a baseplate for magnet coupling and 2) an articulating instrument arm which was deployed to a 45o angle and locked in place using a laparoscopic hex wrench. Successive prototype iterations were evaluated for functionality (deployment, maneuverability, and reach) and utility (operative performance). Four prototypes were evaluated in the first cadaver and 1 new prototype was evaluated in each cadaver thereafter. The 7 prototypes had various baseplate (6.8-10.2 cm) and arm (4.3-9.9 cm) lengths; all instruments had a width of 14mm. Fixed blade (cadavers 1-2) or hook (cadavers 3-4) electrodes were used. The MAGS cautery was inserted through an umbilical fascial defect and used for triangle of Calot dissection and gallbladder removal from the liver bed. For LAP cases, one 12mm and two 5mm operative ports were used; for SSL, a multi-port trocar and percutaneous gallbladder retraction sutures were used. Traditional laparoscopic instruments were used for clipping, cutting, and tissue manipulation. RESULTS: Average cadaver age was 73 years (64-82), BMI was 23 kg/m2 (19-28), and compressed abdominal wall thickness was 1.24 cm (0.4-2.0). During deployment, the electrode tip contacted underlying viscera when using very long arms (9.9cm) or medium arms (6.3cm) in the smallest cadaver (BMI 19); however, deployment was successful in all cases and required 9-24 seconds. Maneuverability was excellent and there were no significant problems encountered with the falciform ligament except for the longest baseplate (10.2cm). Suitable reach during the gallbladder dissection was achieved for all prototypes but required excessive downward pressure for the shortest arm length (4.3cm). Combining all of these factors, the optimal configuration was identified as an arm length of 6.3 cm and a baseplate of 7.8 cm, which generated a vertical reach of 5.3 cm. The hook electrode provided additional traction and was strongly favored over the blade configuration. Both LAP and SSL approaches were successful, yielding complete cholecystectomies in all cases with a dissection time of 20 minutes (11-28); a gallbladder perforation occurred in the first case but none occurred thereafter. Using the MAGS cautery device effectively replaced 1 trocar during LAP cases and, during SSL cases, allowed a traditional grasper to be used through the multi-port trocar instead of a dissection tool. CONCLUSION: This evaluation indicates that the optimal MAGS cautery configuration provides excellent functionality in a human cadaveric cholecystectomy model. Moreover, the MAGS cautery instrument was compatible with a LAP or SSL approach, proving especially useful in facilitating triangulation and eliminating instrument collisions.